Sequel to "The Wandering Heart"
THEY HAD TO ACT IN SECRET, and in haste. It was not difficult to haul the wooden cover up to expose the golden shrine; this was a task they had done frequently to bring pilgrims closer to the saint. Opening the sarcophagus, however, was more difficult than any of them had anticipated in the darkness of night and with a desire for silence. Finally, however, they looked upon the skeleton of their saint. It had been laid carefully in the coffin three hundred years before, at the time of its first translation. The long bones of the arms and legs were arranged around the skull, which looked up at them with empty eye sockets from its place in the center of the coffin. When the prior reached in and pulled it out, everyone could see the hole in the crown of the head, where that part of the holy man’s tonsure had been severed with a sword. Following the path of a medieval pilgrimage, historian Lizzie Manning finds unexpected danger. Chaucer may have based his "Wife of Bath" on a real woman, whose descendant holds certain artifacts. But can the investigation lead to something more sinister? Are the bones of St. Thomas Becket hidden in Canterbury Cathedreal, and is someone willling to kill to protect the secret? Malloy loads her...second Lizzie Manning mystery (after 2009’s The Wandering Heart) with literary history.... British scholar Alison Kent has inherited a reliquary holding what are said to be the bones of St. Thomas à Becket as well as the journal of an ancestor of hers known as “the Weaver,” who might be the model for Chaucer’s Wife of Bath. 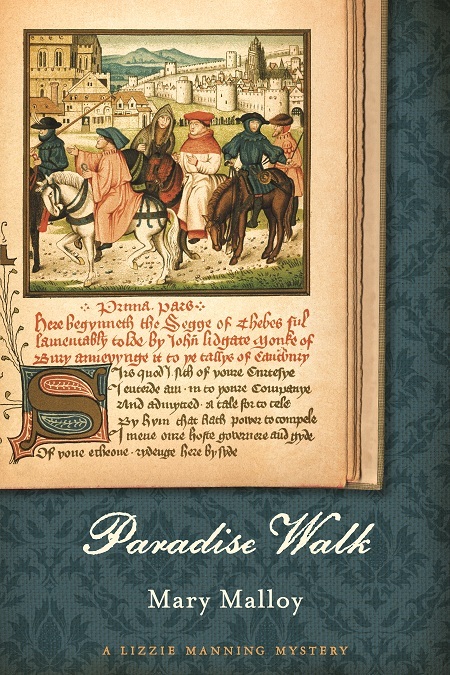 Too frail to make the journey herself, Alison hires American history professor Lizzie Manning to walk the pilgrimage route and glean further evidence for a scholarly publication. Lizzie is thrilled to find the Weaver’s secret mark on artworks at key sites, but when she uncovers a generations-old conspiracy to hide and protect Becket’s real bones, she puts both of their lives in peril. This unconventional mystery will most satisfy those who enjoy intellectual puzzles like Josephine Tey’s The Daughter of Time.